This activity will use another kind of analog sensor, the temperature sensor. We'll create a thermal alert program which lights up the channels of the tri-color LED if it senses 'hot' or 'cold'. We'll also add in the LilyPad Vibe Board to provide some haptic feedback. The LilyPad Temperature Sensor outputs voltage depending on the ambient temperature around it. Similar to the light sensor, the temperature sensor has three sew tabs - positive, negative, and signal (S). The temperature sensor board will output specific voltage at set temperatures - 10mV for every degree Celsius (C), with 0 degrees C being set at 0.5V. The current flowing from the board through the signal tab to your LilyPad Arduino Simple can be converted through a formula to degrees in Celsius or Fahrenheit. What is a Vibration Motor? The LilyPad Vibe Board is a small motor that shakes when current is applied to it. This board can be used in wearable applications to provide simple haptic feedback. In this activity, we'll use thresholds like the Night-Light project, but assign multiple values associated with hot and cold. We'll use comparison operators to determine if the temperature is within the bounds of each threshold. Next we'll be use Serial Monitor to read the values coming from the sensor and insert the formulas in our code to display the temperature in both Celsius and Fahrenheit. 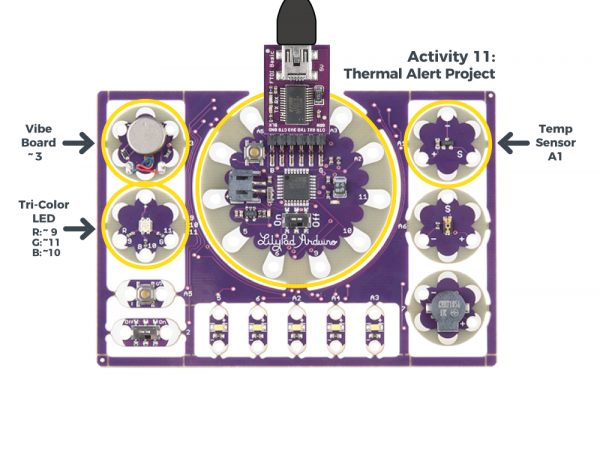 LilyPad Development Board Activity 11: Thermal Alert! the green channel of the tri-color LED will turn on. // Multiply by maximum voltage (4.2V for USB power) and divide by maximum ADC value (1023). Open the serial monitor and press your hand on the temperature sensor to see a reading. Your body temperature may not produce a substantial change in the readings from the sensor. Try holding warm or cold objects hear the sensor (be careful with any condensation from a cold object that it does not drip onto the boards). If the reading is above the 'hot' threshold, the red LED on the tri-color LED will light up and the vibe motor will briefly shake. If the reading is below the 'cold' threshold, the blue LED on the tri-color LED will light up. If the reading is between these two thresholds, the green LED on the tri-color will light up. If you have a certain temperature range in mind, adjust the threshold variables in your code. Store the temperature level in the variable rawTemp. Print the calculated readings to the Serial Monitor. Turn on the LED color based on the hot and cold thresholds. If the temperature is hot, the vibe motor will turn on for a moment to provide feedback. Open the serial monitor to observe the ambient temperature readings converted from the sensor's voltage output. Ways to change the readings: cover the sensor with your hand or breathe on it, move something hot or cold near it. The values on your screen may look different than in this image. The range of readings will depend on your particular surroundings. 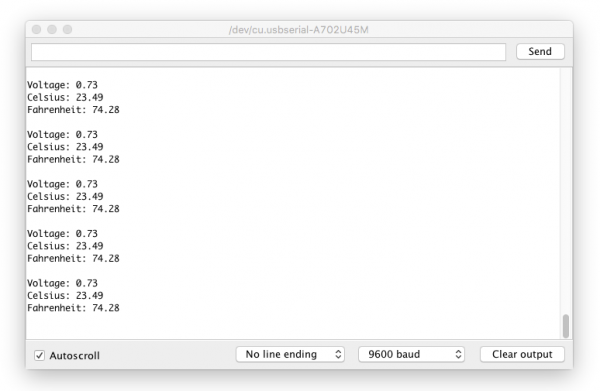 If you are having trouble seeing the values, double check that 9600 baud is selected in the dropdown menu at the bottom right of the window and the auto scroll option is checked. In this program, two thresholds are set for hot and cold readings. Adjust these as needed for the interaction you would like in your project. Up until this point, most of the variables in the examples have been integers (int). In this program, we'll use a long to store the raw temperature readings and floating point (float), which is a number with a decimal point. Learn more about floating point numbers on the Arduino Reference site. First, the program stores the sensor reading into a variable called rawTemp to use in the conversion formulas. Since we know from the sensor's datasheet that voltage being read from the sensor has a relationship to temperature, we can use the voltage = rawTemp * (4.2 / 1023.0) formula to interpret the analog to digital converter's output and determine the voltage. Next, the code uses the voltage to translate to temperature in Celsius. Then a standard formula for converting Celsius to Fahrenheit (F = C*9/5 + 32). The program also prints all the variables to the serial monitor so you can observe them as they change. This is a great way to see the room's ambient temperature using the development board and adjust the temperature thresholds for your alerts as needed. A set of if statements check if the fahrenheit variable is above, below, or between the hot & cold thresholds. As a result, the LilyPad Arduino Simple turns the red, green, and blue LEDs on depending on which threshold the variable is within. In the first if statement, there is also code to turn on the LilyPad Vibe Board to shake if things are too hot. Note that the second check uses an else if instead of just an if statement to check the temperature. This is because the temperature sensor cannot be hot and cold at the same time. Using three individual if statements would be inefficient since the Arduino would check each condition. It is not recommended in this case since the sensor will only be able to provide one temperature value at a time. Since all three condition statements cannot be true at the same time, the test is mutually exclusive and requires each test to be grouped together. Learn more about if/else statements on the Arduino Reference site. Can you change the code so that the buzzer sounds different audio alerts depending on the temperature? Can you use the row of white LEDs as a bar graph to get more specific visual indication of the temperature variations? Try creating a 'quiet' mode by using the switch to silence the vibe board alarm and just display on the tri-color LED.